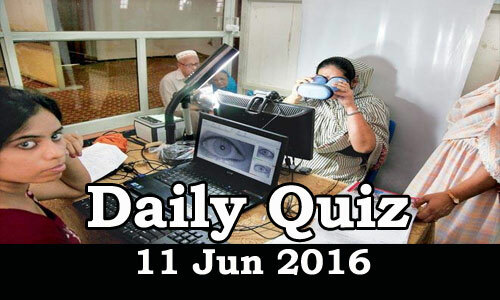 Daily Current Affairs Quiz 11th Jun 2016, Current affairs and GK questions on National and International are listed in the Quiz. Candidates those who are preparing for Government Jobs and IBPS/SBI/RRB exams and all other exams can use these questions. 3. The Union Urban Development Ministry has sanctioned ______ crore rupees for development of Machilipatnam town under the Atal Mission for Rejuvenation and Urban Transformation (AMRUT) scheme. 4. Recently, which State Police official website was hacked by a hacker from ‘Team Pak Cyber Attackers’? 5. Name the mobile application launched by the Union Ministry of Power to serve customers in the field of renewable energy. 6. “Snapdeal.com Nagar” is in which state? 7. India was ranked _______ on a Global Peace Index (GPI) for year 2016 out of 163 countries, making it less peaceful country. 8. India, the US and _____ started the MALABAR-16 naval exercise off the Western Pacific coast, close to the disputed South China sea. 9. Who was elected the Deputy Speaker of the Delhi assembly? 10. Which company has been conferred the National Award for Best Performing Central PSU for Roof Top Solar Power initiatives? [a] Bharat Heavy Electricals Limited. 11. Who has been chosen to be the flag-bearer of the Indian contingent at the Rio Olympics’ opening ceremony on August 5. 12. InderMalhotra passed away recently. Who is he?